Engraving by Peter Paul Rubens, 1638, courtesy of the National Library of Medicine. Hippocrates of Cos II or Hippokrates of Kos (ca. 460 B.C.E. – ca. 370 B.C.E.) - Greek: Ἱπποκράτης; Hippokrátēs was an ancient Greek physician of the "Age of Pericles," and was considered one of the most outstanding figures in the history of medicine. He is referred to as the "father of medicine" in recognition of his lasting contributions to the field as the founder of the Hippocratic school of medicine. This intellectual school revolutionized medicine in ancient Greece, establishing it as a discipline distinct from other fields that it had traditionally been associated with (notably theurgy and philosophy), thus making medicine a profession. However, the achievements of the writers of the Corpus, the practitioners of Hippocratic medicine, and the actions of Hippocrates himself are often commingled; thus very little is known about what Hippocrates actually thought, wrote and did. Nevertheless, Hippocrates is commonly portrayed as the paragon of the ancient physician. In particular, he is credited with greatly advancing the systematic study of clinical medicine, summing up the medical knowledge of previous schools, and prescribing practices for physicians through the Hippocratic Oath and other works. Historians accept that Hippocrates existed, was born around the year 460 B.C.E. on the Greek island of Kos (Cos), and became a famous physician and teacher of medicine. Other biographical information, however, is apocryphal and likely to be untrue (see Legends). 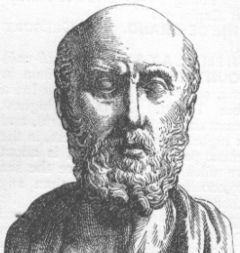 Soranus of Ephesus, a second-century Greek gynecologist, was Hippocrates's first biographer and is the source of most information on Hippocrates' person. Information about Hippocrates can also be found in the writings of Aristotle, which date from the fourth century B.C.E., in the Suda of the tenth century C.E., and in the works of John Tzetzes, which date from the twelfth century C.E. Soranus stated that Hippocrates's father was Heraclides, a physician; his mother was Praxitela, daughter of Phenaretis. The two sons of Hippocrates, Thessalus and Draco, and his son-in-law, Polybus, were his students. According to Galen (129 to 200 C.E. ), a later physician, Polybus was Hippocrates’s true successor, while Thessalus and Draco each had a son named Hippocrates. Soranus said that Hippocrates learned medicine from his father and grandfather, and studied other subjects with Democritus and Gorgias. Hippocrates was probably trained at the asklepieion of Kos, and took lessons from the Thracian physician Herodicus of Selymbria. 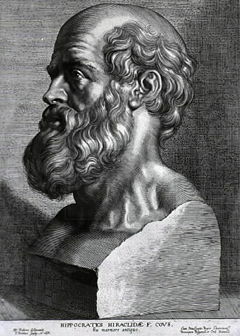 The only contemporaneous mention of Hippocrates is in Plato's dialogue Protagoras, where Plato describes Hippocrates as "Hippocrates of Kos, the Asclepiad". Hippocrates taught and practiced medicine throughout his life, traveling at least as far as Thessaly, Thrace, and the Sea of Marmara. He probably died in Larissa at the age of 83 or 90, though some accounts say he lived to be well over 100; several different accounts of his death exist. "It is thus with regard to the disease called Sacred [epilepsy]: it appears to me to be nowise more divine nor more sacred than other diseases, but has a natural cause from the originates like other affections. Men regard its nature and cause as divine from ignorance and wonder…." Hippocrates is credited with being the first physician to reject superstitions and beliefs that credited supernatural or divine forces with causing illness. Hippocrates was credited by the disciples of Pythagoras of allying philosophy and medicine. He separated the discipline of medicine from religion, believing and arguing that disease was not a punishment inflicted by the gods but rather the product of environmental factors, diet and living habits. Indeed there is not a single mention of a mystical illness in the entirety of the Hippocratic Corpus. However, Hippocrates did work with many convictions that were based on what is now known to be incorrect anatomy and physiology, such as Humorism. Ancient Greek schools of medicine were split (into the Knidian and Koan) on how to deal with disease. The Knidian school of medicine focused on diagnosis, but was dependent on many faulty assumptions about the human body: Greek medicine at the time of Hippocrates knew almost nothing of human anatomy and physiology because of the Greek taboo forbidding the dissection of humans. The Knidian school consequently failed to distinguish when one disease caused many possible series of symptoms. The Hippocratic school achieved greater success by applying general diagnoses and passive treatments. Its focus was on patient care and prognosis, not diagnosis. It could effectively treat diseases and allowed for a great development in clinical practice. Hippocratic medicine and its philosophy are far removed from that of modern medicine. Now, the physician focuses on specific diagnosis and specialized treatment, both of which were espoused by the Knidian school. This shift in medical thought since Hippocrates's day has caused serious criticism over the past two millennia, with the passivity of Hippocratic treatment being the subject of particularly strong denunciations; for example, the French doctor M. S. Houdart called the Hippocratic treatment a "meditation upon death". The Hippocratic school held that all illness was the result of an imbalance in the body of the four humours, fluids which in health were naturally equal in proportion (pepsis). When the four humours, blood, [bile|[black bile]], yellow bile and phlegm (mucus), were not in balance (dyscrasia, meaning "bad mixture"), a person would become sick and remain that way until the balance was somehow restored. Hippocratic therapy was directed towards restoring this balance. For instance, using citrus was thought to be beneficial when phlegm was overabundant. Another important concept in Hippocratic medicine was that of a crisis, a point in the progression of disease at which either the illness would begin to triumph and the patient would succumb to death, or the opposite would occur and natural processes would make the patient recover. After a crisis, a relapse might follow, and then another deciding crisis. According to this doctrine, crises tend to occur on critical days, which were supposed to be a fixed time after the contraction of a disease. If a crisis occurred on a day far from a critical day, a relapse might be expected. Galen believed that this idea originated with Hippocrates, though it is possible that it predated him. A drawing of a Hippocratic bench from a Byzantine edition of Galen's work in the second century C.E. Hippocratic medicine was humble and passive. The therapeutic approach was based on "the healing power of nature" ("vis medicatrix naturae" in Latin). According to this doctrine, the body contains within itself the power to re-balance the four humours and heal itself (physis). Hippocratic therapy focused on simply easing this natural process. To this end, Hippocrates believed "rest and immobilization [were] of capital importance". In general, the Hippocratic medicine was very kind to the patient; treatment was gentle, and emphasized keeping the patient clean and sterile. For example, only clean water or wine were ever used on wounds, though "dry" treatment was preferable. Soothing balms were sometimes employed. Hippocrates was reluctant to administer drugs and engage in specialized treatment that might prove to be wrongly chosen; generalized therapy followed a generalized diagnosis. Potent drugs were, however, used on certain occasions. This passive approach was very successful in treating relatively simple ailments such as broken bones which required traction to stretch the skeletal system and relieve pressure on the injured area. The Hippocratic bench and other devices were used to this end. One of the strengths of Hippocratic medicine was its emphasis on prognosis. At Hippocrates's time, medicinal therapy was quite immature, and often the best thing that physicians could do was to evaluate an illness and induce its likely progression based upon data collected in detailed case histories. Hippocratic medicine was notable for its strict professionalism, discipline and rigorous practice. The Hippocratic work On the Physician recommends that physicians always be well-kempt, honest, calm, understanding, and serious. 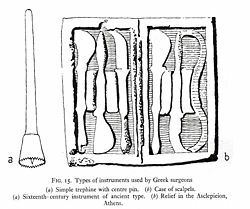 The Hippocratic physician paid careful attention to all aspects of his practice: he followed detailed specifications for, "lighting, personnel, instruments, positioning of the patient, and techniques of bandaging and splinting" in the ancient operating room. He even kept his fingernails to a precise length. The Hippocratic School gave importance to the clinical doctrines of observation and documentation. These doctrines dictate that physicians record their findings and their medicinal methods in a very clear and objective manner, so that these records may be passed down and employed by other physicians. Hippocrates made careful, regular note of many symptoms including complexion, pulse, fever, pains, movement, and excretions. He is said to have measured a patient's pulse when taking a case history to know if the patient lied. Hippocrates extended clinical observations into family history and environment. "To him medicine owes the art of clinical inspection and observation". For this reason, he may more properly be termed as the "Father of Clinical Medicine". Clubbing of fingers secondary to pulmonary hypertension in a patient with Eisenmenger's syndrome. First described by Hippocrates, clubbing is also known as "Hippocratic fingers"
Hippocrates began to categorize illnesses as acute, chronic, endemic and epidemic, and use terms such as, "exacerbation, relapse, resolution, crisis, paroxysm, peak, and convalescence." Another of Hippocrates's major contributions may be found in his descriptions of the symptomatology, physical findings, surgical treatment and prognosis of thoracic empyema, i.e., suppuration of the lining of the chest cavity. His teachings remain relevant to present-day students of pulmonary medicine and surgery. Hippocrates was the first documented chest surgeon and his findings are still valid. 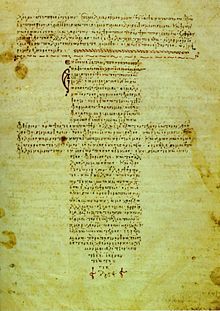 The Hippocratic Corpus (Latin: Corpus Hippocraticum) is a collection of around 70 early medical works from ancient Greece, written in Ionic Greek. The question of whether Hippocrates himself was the author of the corpus has not been conclusively answered, but the volumes were probably produced by his students and followers. Because of the variety of subjects, writing styles and apparent date of construction, scholars believe Hippocratic Corpus could not have been written by one person (Ermerins numbers the authors at 19). The corpus was attributed to Hippocrates in antiquity, and its teaching generally followed principles of his; thus it came to be known by his name. 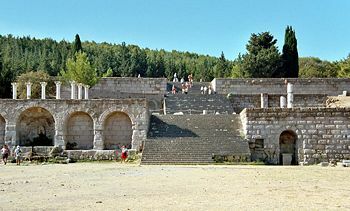 It might be the remains of a library of Kos, or a collection compiled in the third century B.C.E. in Alexandria. The Hippocratic Corpus contains textbooks, lectures, research, notes and philosophical essays on various subjects in medicine, in no particular order. These works were written for different audiences, both specialists and laymen, and were sometimes written from opposing viewpoints; significant contradictions can be found between works in the Corpus. Notable among the treatises of the Corpus are The Hippocratic Oath; The Book of Prognostics; On Regimen in Acute Diseases; Aphorisms; On Airs, Waters and Places; Instruments of Reduction; On The Sacred Disease; etc. The Hippocratic Oath, a seminal document on the ethics of medical practice, was attributed to Hippocrates in antiquity. This is probably the most famous document of the Hippocratic Corpus, known for its clear message "I will prescribe regimens for the good of my patients according to my ability and my judgment and never do harm to anyone…. Recently the authenticity of the document has come under scrutiny. While the Oath is rarely used in its original form today, it serves as a foundation for other, similar oaths and laws that define good medical practice and morals. Such derivatives are regularly taken today by medical graduates about to enter medical practice. Mural painting showing Galen and Hippocrates. Twelfth century; Anagni, Italy. Hippocrates is widely considered to be the "Father of Medicine". His contributions revolutionized the practice of medicine; but after his death the advancement stalled. So revered was Hippocrates that his teachings were largely taken as too great to be improved upon and no significant advancements of his methods were made for a long time. The centuries after Hippocrates's death were marked as much by retrograde movement as by further advancement. For instance, "after the Hippocratic period, the practice of taking clinical case-histories died out…," according to Fielding Garrison. After Hippocrates, the next significant physician was Galen, a Greek who lived from 129 to 200 C.E. Galen perpetuated Hippocratic medicine, moving both forward and backward. In the Middle Ages, Arabs adopted Hippocratic methods. After the European Renaissance, Hippocratic methods were revived in Europe and even further expanded in the nineteenth century. Notable among those who employed Hippocrates's rigorous clinical techniques were Thomas Sydenham, William Heberden, Jean-Martin Charcot, and William Osler. Henri Huchard, a French physician, said that these revivals make up "the whole history of internal medicine". According to Aristotle's testimony, Hippocrates was known as "the Great Hippocrates". Concerning his disposition, Hippocrates was first portrayed as a "kind, dignified, old country doctor'" and later as "stern and forbidding". He is certainly considered wise, of very great intellect and especially as very practical. Francis Adams describes him as "strictly the physician of experience and common sense". His image as the wise, old doctor is reinforced by busts of him, which wear large beards on a wrinkled face. Many physicians of the time wore their hair in the style of Jove and Asklepius. Accordingly, the busts of Hippocrates that we have could be only altered versions of portraits of these deities. Hippocrates and the beliefs that he embodied are considered medical ideals. Fielding Garrison, an authority on medical history, stated, "He is, above all, the exemplar of that flexible, critical, well-poised attitude of mind, ever on the lookout for sources of error, which is the very essence of the scientific spirit". "His figure… stands for all time as that of the ideal physician,” according to A Short History of Medicine, inspiring the medical profession since his death. "Life is short, [the] art long, opportunity fleeting, experiment treacherous, judgment difficult." Some stories of Hippocrates's life are likely to be untrue because of their inconsistency with historical evidence, and because similar or identical stories are told of other figures such as Avicenna and Socrates, suggesting a legendary origin. Even during his life, Hippocrates's renown was great, and stories of miraculous cures arose. For example, Hippocrates was supposed to have aided in the healing of Athenians during the Plague of Athens by lighting great fires as "disinfectants" and engaging in other treatments. There is a story of Hippocrates curing Perdiccas, a Macedonian king, of "love sickness." Neither of these accounts is corroborated by any historians and they are thus unlikely to have ever occurred. Even the honey from a beehive on his grave was believed to have healing powers. 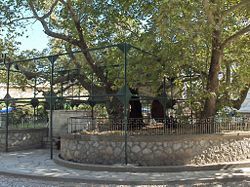 Kos town: The Plane Tree of Hippocrates, under which Hippocrates is said to have worked. Another legend concerns how Hippocrates rejected a formal request to visit the court of Artaxerxes, the King of Persia. The validity of this is accepted by ancient sources but denied by some modern ones, and is thus under contention. Another tale states that Democritus was supposed to be mad because he laughed at everything, and so he was sent to Hippocrates to be cured. Hippocrates diagnosed him as having a merely happy disposition. Democritus has since been called "the laughing philosopher". 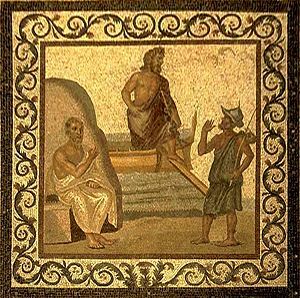 An image of Hippocrates on the floor of the Asclepieion of Kos, with Asklepius in the middle. Some clinical symptoms and signs have been named after Hippocrates as he is believed to be the first person to describe those. "Hippocratic face" is the change produced in the countenance by death, or long sickness, excessive evacuations, excessive hunger, and the like. Clubbing, a deformity of the fingers and fingernails, is also known as Hippocratic fingers. Hippocratic succussion is the internal splashing noise of hydropneumothorax or pyopneumothorax. 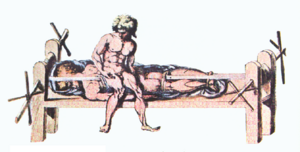 Hippocratic bench (a device which uses tension to aid in setting bones) and Hippocratic cap-shaped bandage are two devices named after Hippocrates. Hippocratic Corpus and Hippocratic Oath are also his namesakes. The drink hypocras, a spiced wine, is also believed to be invented by Hippocrates. Risus sardonicus, a sustained spasming of the face muscles may also be termed the Hippocratic Smile. In modern age, a lunar crater has been christened after him — the Hippocrates. Hippocratic Museum, a museum on the Greek island of Kos is dedicated to him. The Hippocrates Project is a program of the New York University Medical Center to enhance education through use of technology. Project Hippocrates (an acronym of "HIgh PerfOrmance Computing for Robot-AssisTEd Surgery") is an effort of the Carnegie Mellon School of Computer Science and Shadyside Medical Center, "to develop advanced planning, simulation, and execution technologies for the next generation of computer-assisted surgical robots." Adams, Francis (1891), The Genuine Works of Hippocrates, William Wood and Company, New York . Boylan, Michael (2006), Hippocrates, Internet Encyclopedia of Philosophy [September 28 2006] . Britannica Concise Encyclopedia (2006), Soranus of Ephesus, Encyclopædia Britannica, Inc. [December 17 2006] . Encyclopedia Britannica (1911), HIPPOCRATES, Encyclopedia Britannica, Inc. [October 14 2006] . Schwartz, Robert A., Richards, Gregory M. & Goyal, Supriya (2006), Clubbing of the Nails, WebMD [September 28 2006] . Garrison, Fielding H. (1966), History of Medicine, W.B. Saunders Company, Philadelphia . Hippocrates (2006), On the Sacred Disease, Internet Classics Archive: The University of Adelaide Library [December 17 2006] . Internet Encyclopedia of Philosophy (2006), Democritus, The University of Tennessee at Martin [December 17 2006] . Jones, W. H. S. (1868), Hippocrates Collected Works I, Cambridge Harvard University Press [September 28 2006] . Leff, Samuel & Leff, Vera. (1956), From Witchcraft to World Health, Camelot Press Ltd., London and Southampton . Major, Ralph H. (1965), Classic Descrptions of Disease, Springfield, Illinois . Margotta, Roberto (1968), The Story of Medicine, Golden Press, New York . Martí-Ibáñez, Félix (1961), A Prelude to Medical History, MD Publications, Inc., New York, Library of Congress ID: 61-11617 . National Library of Medicine (2006), Images from the History of Medicine, National Institutes of Health [December 17 2006] . National Library of Medicine (2000), Objects of Art: Tree of Hippocrates, National Institutes of Health [December 17 2006] . Nuland, Sherwin B. (1988), Doctors, Knopf, ISBN 0394551303 . Pinault, Jody Robin (1992), Hippocratic Lives and Legends, Brill Academic Publishers, Köln, ISBN 9004095748 . Plato (2006), Protagoras, Internet Classics Archive: The University of Adelaide Library [December 17 2006] . Project Hippocrates (1995), Project Hippocrates, Center for Medical Robotics and Computer Assisted Surgery, Carnegie Mellon School of Computer Science [December 30 2006] . Rutkow, Ira M. (1993), Surgery: An Illustrated History, Elsevier Science Health Science div, London and Southampton, ISBN 0-801-6-6078-5 . Singer, Charles & Underwood, E. Ashworth (1962), A Short History of Medicine, Oxford University Press, New York and Oxford, Library of Congress ID: 62-21080 . Adams, Francis (translator)  (1994), Works by Hippocrates, Daniel C. Stevenson, Web Atomics, 1994–2000, The Internet Classics Archive . Alberto Jori (1996), Medicina e medici nell'antica Grecia. Saggio sul 'Perì téchnes' ippocratico, il Mulino, Bologna (Italy) . Kalopothakes, M. D. (1857), An essay on Hippocrates, King and Baird Printers, Philadelphia . Lopez, Francesco (2004), Il pensiero olistico di Ippocrate. Percorsi di ragionamento e testimonianze. Vol. I, Edizioni Pubblisfera, Cosenza (Italy) . This page was last modified on 24 February 2014, at 19:25.